The Mobile Wi-Fi Hard Drive Enclosure from Macally is a wireless portable storage solution capable of holding one 2.5" hard drive up with a storage capacity up to 3TB. This enclosure allows you to stream your content including music, photos, movies, videos, documents and more via a WPA/WPA2 encrypted 802.11b/g/n Wi-Fi connection. 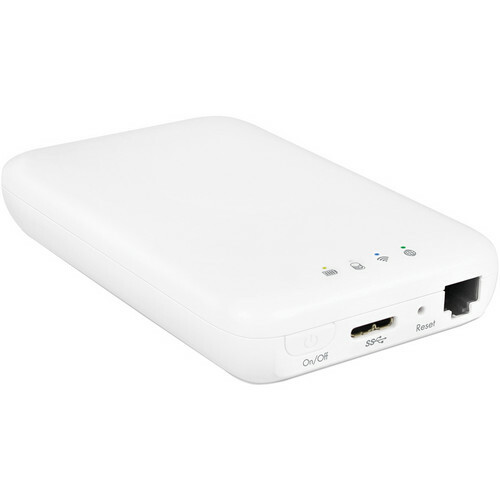 Along with Wi-Fi connectivity, this hard drive enclosure also comes equipped with one USB 3.0 port and one 10/100 Fast Ethernet port for a stable, secure data connection. Stream your content to both iOS and Android devices via the included WiFiStor app available for download in both the Apple iTunes and Android Google Play stores. Once configured, you can take this enclosure with you on the go as it comes equipped with a 3,000mAh battery for up to 4 hours of continuous playback. Number of Bays 1 x 2.5"
Box Dimensions (LxWxH) 7.9 x 5.6 x 1.5"
Mobile Wi-Fi Hard Drive Enclosure is rated 3.8 out of 5 by 6. Rated 3 out of 5 by JustRaymond from Easy to Use, But Unreliable I just recently installed an old 2.5 Hitachi HGST 500 GB 7200 RPM HDD I had lying around in the Macally Wi-Fi Hard Drive Enclosure (WIFIHDD). The hard drive was easy to install in the enclosure and it took little effort to snap the enclosure shut. The enclosure's USB 3.0 support is awesome and the drive works great when used strictly as an external USB drive. The WLAN network setup for the enclosure is flaky and you may have to do it twice in order for the management software to maintain it's WLAN network settings and allow you to connect to the enclosure wirelessly via the WiFiStor software. Ultimately, once you get the enclosure properly configured and connect to the network, it works good with your iPhone, iPad or PC. Also, each time your PC restarts or goes into standby mode, you have to reconnect to the device using the WiFiStor software interface. Rated 2 out of 5 by Traveling Ted from Could not install 2.5 drive in enclosur According to instructions, you can use a 2.5 drive up to 9.5 mm thick. Mine was 9 mm and I could not get the enclosure to close once the drive was connected to the internal hardware. It's a nice idea, but the end result is I'll probably have to send it back. Rated 5 out of 5 by Big Daddy J from Nice enclosure The app is a little basic for my tastes but the performance is good and after a couple of coctails I'll give it 5 stars. Also, once you close the case with the hard drive in it is very difficult to get back open. Rated 4 out of 5 by Ronald from Works great Works as advertised. Connects to the network with no problems and works with a SSD that I installed in it also. Rated 5 out of 5 by Larry F. from Great device. Had a net book with a 500gb hard drive that fizzled. Took the hard drive out and installed it into the enclosure. As soon as it was plugged in, it came on. With iPad, PC and Android apps can transfer files to and from all my toys. Rated 4 out of 5 by JM3202 from good enclosure Installed an older hard drive that was doing nothing and it worked pretty well. Connects to computer well, lost connection a couple times but not a big deal. Enclosure was tough to snap shut, you really need to push down. can it be used as it charges? Can it be used free? Sorry, free from what? It's not really an external HD, but more of a media server, for which you use the proprietary interface. does it come with a storage drive inside? Asked by: Dr Tania L.
No. You have to already have a hard drive or you have to purchase a hard drive and put it in the wi-fi hard drive enclosure.